The Kodak Compact Microfiche Reader was developed by Steve Hines, at the Kodak Research Laboratories and is the subject of Steve's first utility patent. The objective of this project was to provide a convenient light-weight microfiche viewer. The Kodak Compact Microfiche Reader props up on a desk at a convenient viewing angle. The microfiche is held with a pressure pad in the handle which contains the light source. 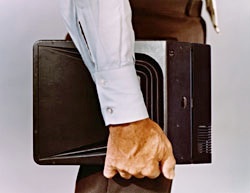 The Compact Microfiche Reader wins in comparison in space and weight with four or more microfiche, compared to carrying hard-copy. This Compact Microfiche Reader is not a rear-projection device as it may appear. The image is being projected on an internal front screen, from a side angle which causes the image to be keystoned. When the screen is hinged open, at an angle to the Fresnel (pronounced: Fra-nel) lens, the keystoned image is magnified more on the right to create a rectangular image. The Fresnel lens on the front (1) magnifies the image differentially to make the image look rectangular, (2) acts as a field lens to brighten the corners, and (3) adds a blue tint to compensate for the warm color of the projection lamp which is under-volted to increase lamp life. 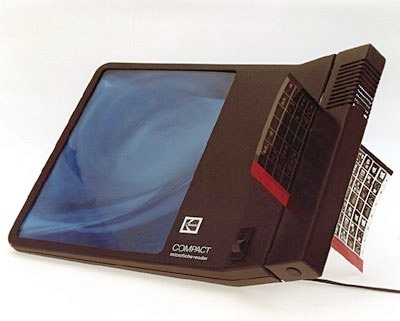 When this Compact Reader was developed, conventional microfiche readers were 110V desk-top units approximately the size and weight of a television of the same screen size. When closed, the keystoned projection screen can be seen, flat up against the inside of the Fresnel lens. As the screen is hinged open from the back, the right side of the screen becomes magnified by the Fresnel lens until the screen looks rectangular. An internal view of the strut carrying the projection screen is opened by pulling on the bellows. A hinge in the strut is molded in a slight dome to snap the strut open. However, when the hinge is pressed from outside the rubber bellows, the hinge buckles allowing the strut to fold flat. The Compact Reader is one inch thick, making it easy to carry. • Folding, front-projection microfiche viewer. • Space saving, compared to carrying printed material. • Screen size: 6.1 x 8 inches. • Lamp-housing cover removes easily for lamp replacement. • The air in the bellows cools the lamp when closing. • Low voltage, safe operation. • Power: 12V DC, from external AC adapter or battery. This is not a product for sale, but is shown as an example of technology, developed by Steve Hines, which clients can now expect from HinesLab on a contract basis. U.S Patent 4,157,214 contains information on the front-projection version (shown) and a rear-projection version.